the sake of this photo. ERIC: Kurt, I think we really need to ramp up our mosquito service and provide this quality service to all of our customers, as well as any new customers. KURT: We need to crawl before we run. Also, aren’t you concerned about the pollinators, which have been a hot topic lately? ERIC: It’s true the pollinators have been a hot topic, but so has mosquito-borne disease. I’ve talked to so many companies around the country that are offering mosquito service, and also to our supplier and manufacturer reps. They said it can be done without affecting the pollinators. There are strict regulations on when you can and cannot treat for mosquitoes, and everyone’s being very careful. KURT: I have heard the same thing, but how are we going to roll it out? We have been running a trial program at our houses, and it’s working. I’m just concerned about routing. Will we have enough jobs to dedicate a technician to just mosquito service? ERIC: We can have our universal techs do it. They are the best in the industry, and highly trained. I’m sure they can handle it. KURT: But our universal techs are extremely busy during the mosquito season. They’re already stretched for time with termite bait installs, initial pest control services and one-time services. We get the majority of our conventional bed bug services during our busy season as well. ERIC: OK, so what if we hire someone to only do the mosquito service, then? KURT: We could, but he or she would be running all over the city, especially for our branch offices. It’s only a seasonal treatment, so what is that person going to do in an Ohio and Kentucky winter? ERIC: Point taken. But I’m sure we can find something for the person we hire for mosquito service to do in the off-season. KURT: I have a better idea. If we are going to do this, let’s have our specialty service department do the mosquito jobs. We can schedule them accordingly, so they aren’t running all over the city. We will just have to watch the weather — that could really mess with our schedule. ERIC: Good — scheduling is your problem with the service department. As for the sales side of things, we’ll just sell it and let you take care of it. We will sell that over the phone as well, and trust me, before long we will be hiring more people. We will be so busy! No one likes mosquitoes. KURT: Settle down a little bit. We need to perfect this before we get such a high demand that we can’t keep up. That doesn’t help us at all. We haven’t done service like this before. Our brand and company reputation of taking great care of the customer are the most important things. ERIC: Agreed, but there is so much possibility! KURT: There is a lot of possibility, but we don’t know what we don’t know. Let’s roll out a mosquito program, but don’t sell it over the phone yet because there are conditions that change that we can’t see from Google Earth. ERIC: OK, I guess I’m slowing my sales down again. 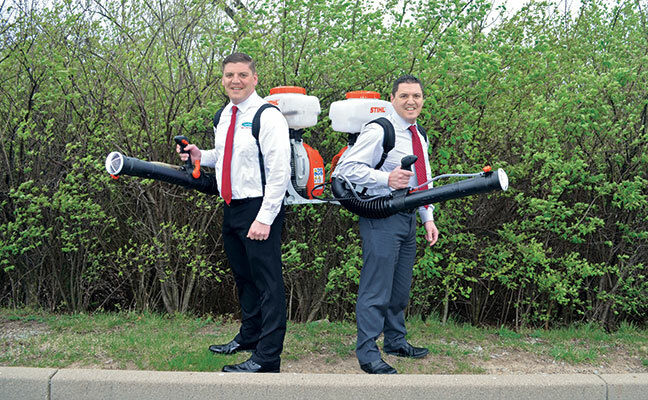 Brothers Eric and Kurt Scherizinger are vice president of sales and marketing and vice president of operations, respectively, for Scherzinger Termite & Pest Control, Cincinnati. The fourth-generation pest management professionals can be reached at eric@stopzbugs.com and kurt@stopzbugs.com.